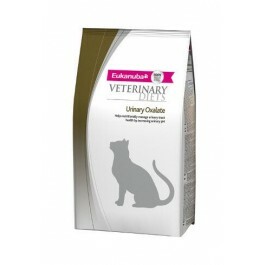 Eukanuba Veterinary Diets Urinary Oxalate for Cats is formulated with a low level of calcium, low level of vitamin D and has urine alkalinising properties. Urinary Oxalate for Cats should be fed for up to 6 months. For any extended use beyond this, we recommend thay you consult your veterinarian. This diet is also available in a wet food. Feeding Instructions: It is recommended that a veterinarian's opinion be sought before use or before extending the period of use. Your veterinarian may suggest specific feeding instructions for your cat, or ask you to follow the standard portions shown in the feeding chart.